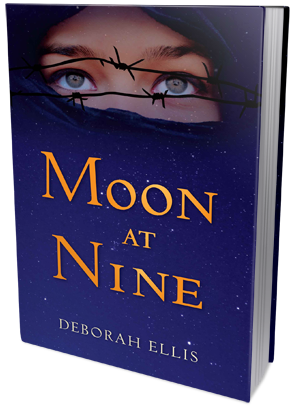 Welcome to Day 10 of the SECRETS OF MOON AT NINE BLOG TOUR, featuring Moon at Nine – a timely new YA novel from humanitarian and award-winning author Deborah Ellis. Each stop on the 2-week tour will feature revealing posts, a chance to win a copy of the novel, and a chance to enter the grand prize giveaway! Nothing I say will do justice to Moon at Nine. This emotionally powerful story will stay with you long after you finish. The fact that it is based off a true story is utterly heart wrenching. The fact that in some countries this still happens unbearable. Farrin comes from a wealthy family, a fact that keeps her ostracized from her fellow classmates, that desire to bring the Shah back into power. She is instructed by her mother to keep her nose down and not draw attention to herself. For the most part she does a good job, until Sadria shows up anyway. Farrin and Sadria become instant friends; a friendship which quickly blooms into something more. While their relationship is no more than your typical relationship between young people, given the time and country they are putting their lives in danger. If caught, the girls would be facing a death sentence, regardless of the fact that they are so young. The plot progresses rather quickly and while I don't get as fully invested into their relationship as I could have, I am invested into the characters as individuals. I especially sympathize with Farrin as the story is told from her perspective and we are in her head. I regret is that I finished this book at work and not in the privacy of my own home. I needed to sit in silence with my thoughts and reflect on everything I just read. I needed to remember Farrin and Sadira's story without my coworkers jabbering on and phones ringing. I urge you that even if LGBT novels to not appeal you, to pick up this book. Lock yourself away in your room until you finish it. It's only 244 pages, it won't take you long time. Once you finish this, I want you to have the reflection experience I didn't. Think about the story of these two young girls who grew up in a country and a time where they had to hide their true selves or be murdered. Also, ensure your friends are reading it too - you will want to discuss it! Or, come back to me and we'll talk. This is the type of novel that needs to be discussed with friends, in a classroom, over the internet, what have you. Deborah beautifully tells the story that will touch your heart and your soul. Farrin and Sadria's story needs to be told, it needs to reach those who are unaware that the LGBT community is suffering in these countries where being gay or lesbian is a criminal act, punishable by fines, hard labor, prison, or even death. And while their story is one among thousands, maybe millions, it gives a voice to those who have been silenced and forgotten. Editor's Perspective: Why is Deb Your Secret Weapon? When I first met Deb in August 2001, I was struck by her complete honesty and genuine nature. To this day she still has a humility crossed with confidence that is quite refreshing. It’s a fantastic combination; you don’t find it very often. Working on that first book, A Company of Fools, I found Deb so easy to work with. She was creative, she was easygoing...and she had a certain light in her eyes that was really striking. It was clear she was a very special person. I think that is what wins her so many fans. When she goes out and speaks and meets people, she exudes charisma. People just love her. And of course now, thirteen years later, she’s such a pro in every way. Dealing with media, young people, teachers, and librarians, she handles herself so well. But through all that she still comes across with this extraordinary authenticity and generosity of spirit. And I think that’s why I like working with her most of all. Because she’s so honest and diligent. When Deborah says she’s going to do something, she does it. She comes through. Deborah Ellis is probably one of Canada’s most well-known children’s authors. She’s captured the hearts of both children and adults with the kind of book she writes: stories about children struggling in the midst of social injustice. She’s really put her stamp on that particular niche. Deb was very open-minded when I talked to her about Moon at Nine. She connected so well with the real Farrin, and she says the story really had an impact on her. It had an impact on me, too, and on our editor Ann, and all of us who worked on the book. Another thing that’s wonderful about Deborah is her willingness to travel, to discover. When we worked on The Heaven Shop, which was a story about an orphan of AIDS in Malawi, she was incredibly brave. She travelled alone to Malawi in southeast Africa where she didn’t speak any of the languages, and found her way from one contact to another. In spite of the challenging journey, she managed to come home with all kinds of interviews and the basis for a fabulous book. She’s pretty special. We at Pajama Press are proud to stand behind Deborah in her work to bring attention to social injustices around the world. We have plans to publish more titles with her, and I know I will endeavor to publish her for the rest of my career.